Robo4j.io framework has been selected for JavaOne4Kids part. Robo4j.io autor (@miragemiko) and the main commiter to the project has also attended many talks about robotics, Internet of Things and future inotvations, similar to the different discussion about Java 9 fugure. 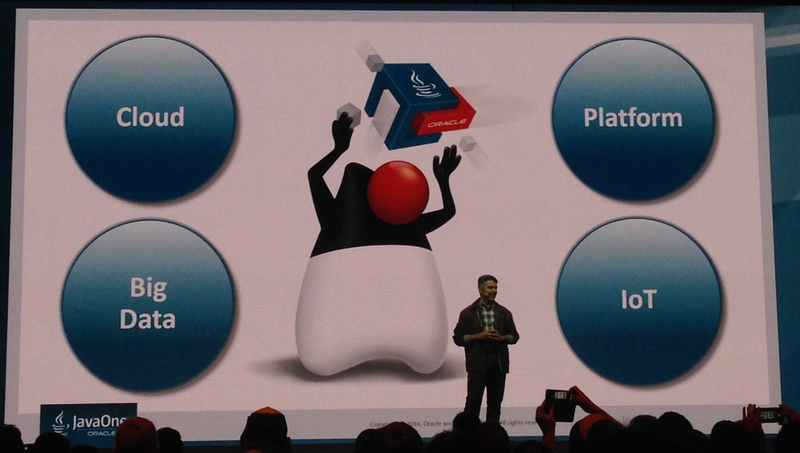 He also participated at Java Community Process and Java Hub at JavaOne 2016.
robo4j has been since the beginning designed a the non-blocking platform for highly concurrent tasks/events that needs to under the certain conditions synchronised and processed. robo4j has been divided into the fully independent units. Those units are accepting/providing connection with the rest of the world using specific protocols. Units are distributed over the ecosystem and they are fully independent. robo4j provides sockets to plug different types of data storages and algorithms that are later used as the inputs/outputs for internal or external actions. We do pay special attention on those three mentioned points. Why ? 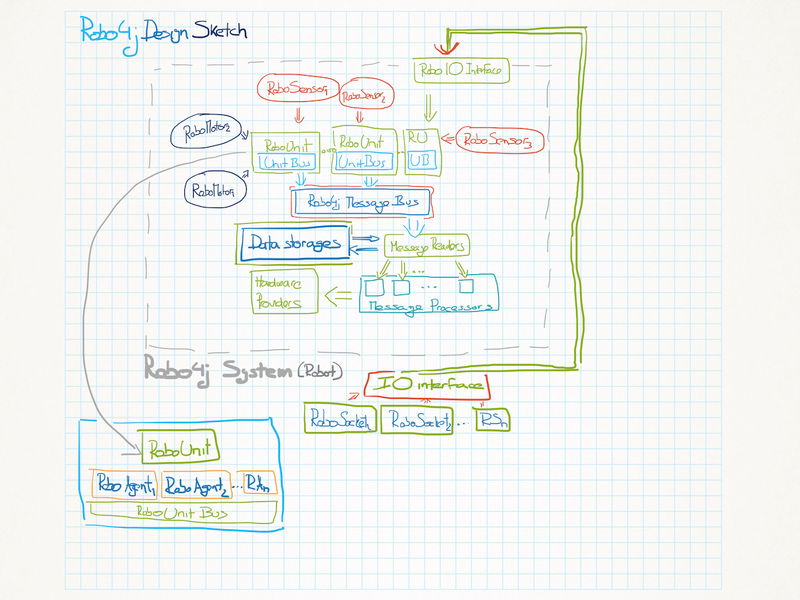 Robo4j.io framwork intents to be the framework that fully hightly supports distributed systems. Such point is becoming to be crucial in the upcoming age of Internet Of Things, Clouds etc. All of three mentioned points are representing a lot of work and touched framework continual evolution that need to be done to achieve the expecting goal. 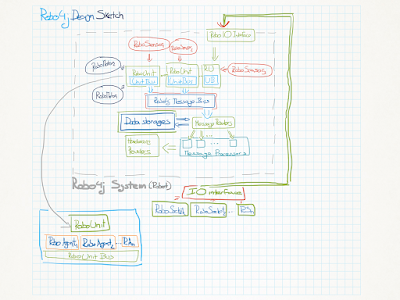 Following design sketch should draw out the core ideas how the Robo4j framework is internally designed and what to expect. The ability of any Image to carry much bigger mass of information than written text is fully appreciated here. Robo4j Framework is meant to be fully agent system. Every agent has ability to interact with any other agent over appropriate interfaces. Every agent can create his own decision which is then transmitted to the Robo4j core message bus. Robo4j Message Bus represents the abstraction of the communication line with underlying core system logic. Core logic is then executed on real hardware which represent the robot to the outside word. Robo4j provides direct IO Socket based communication line which allows user to interact with the Robo4j System. Every external user action is then transmitted to the system core, analysed and presented as the Robo4j Event (Reaction). Robo4j provides also various connector with different data storages. In general Robo4j is Agent and Event based system which synchronises asynchronously incoming events. 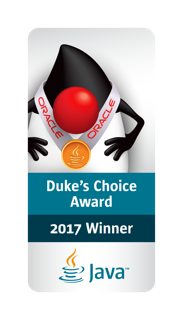 Robo4j will introduce and present its simplicity at JavaOne4Kids (not Only for Kids ;) as the part of JavaOne conference. We have reserved 2 hours slot full of fun. We in those two amazing hours we will assemble the robot and write different programs. Robo4j will make robot alive. See you there! Robo4j is looking forward for you!